Thanks to Sandy Benitez for publishing my poem ‘March Madness” today. 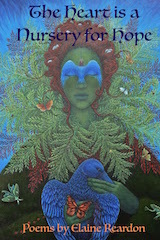 Click on the link to take a look at this poetry journal, and if you have time, please leave a comment. And yes, I just took this photo yesterday. share old stories of the troubles. as steam rises into the night. our bones soak in warmth. jacarandra tree heavy with purple bloom. how our lives have brought us here. First, A shout out to thank the Greenfield Recorder, who just featured a story about the writing group in our library that I facilitate I can’t promise that the link will work. Also more good news: I’m a finalist for a residency at the Hawaiian National Volcanic Park! Cross your fingers for me! The Primavera National Forest in Mexico isn’t far from Guadalajara. It’s been a sacred place to the people who lived there long past, and they still honor their roots. Thankfully, the area has been preserved as a National Forest. Rio Caliente wanders through, hot steam rising, and it’s wonderful to soak in her waters, once they are cool enough to enter. Black obsidian rock covers hills here and there. like a coating of thick pudding that has hardened, with the ripples still evident. When I’ve walked up the hillsides I’ve picked up pieces that are just below a thin layer of dusty soil. It’s a place I stumbled into, guided by a small article in National Geographic magazine years ago, fortunately, as I’ve done some healing there, as have others. Next, to a bend in the river, there is a convent that many women traveled to as their last hope. Many had cancer, according to the Mother Superior, a tiny, fierce force of nature. She followed the church precepts she gathered herbs on the hillsides for healing and treated women with the herbs, vegetables they grew, and with the hot river water baths. She also practiced iridology to decide how to treat her patients. I would have stayed with her to help, had I spoken Spanish well enough. She asked mi hija, my daughter, to stay, and she helped to translate one afternoon. This poem is in memory of her and all the people of the convent. A portion of my heart remains there. This poem is in memory of her and all the people of the convent. Todavia esta toxica—everything is toxic. herbs gathered on hillside and forest. She knows I won’t stay here. all of Mexico and the Southwest. The convent fills with grace and prayer. prepares herbs gathered in the hill. the beginning and end for so many. I received this in the mail yesterday, and I’m pretty happy about it! the stove now. And snow begins to fall.